The average guy thinks Ahern, Whitaker, Benezra and Cheuk could speed it up a little. Actually, that same average guy thinks Cheuk could speed up a lot. A lot of guys want to go back to Kelowna and Sunriver. Way too many if you ask me. The vast majority of guys (16-5) are willing to pay more than $100-120 for three high-quality shirts. The average guy wants to to do a group restaurant dinner exactly once. This entry was posted in Miscellaneous on October 1, 2012 by greenlakenick. 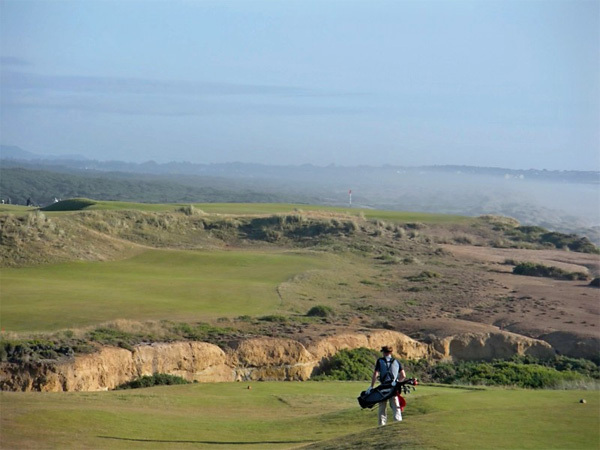 It’s no big secret — Paul Sharkey thinks oft-times Greenspan site Bandon Dunes is just short of heaven on earth. I happen to agree, at least if you define “earth” as the Pacific Northwest. Apparently not everyone agrees. 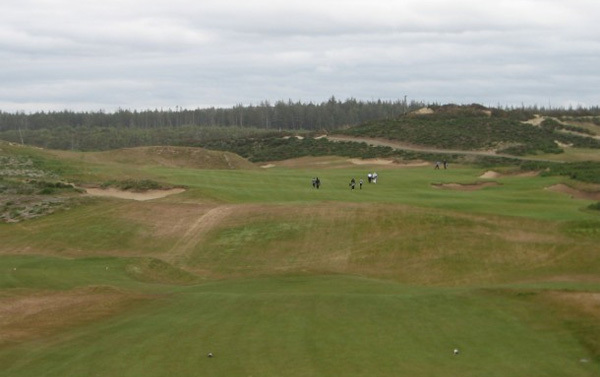 Golf Digest‘s Matt Ginella reported earlier this week that his colleague Ron Whitten, GD‘s chief course architecture critic, thinks Bandon is overrated. Sharkey takes a good many yearly vacations. Here’s hoping he doesn’t run into Whitten at the airport on his way to one of them. The World Team’s captain is no shrinking violet. Mr. Whitten, beware. This entry was posted in Miscellaneous and tagged Bandon Dunes, Golf Digest, Ron Whitten on January 20, 2012 by greenlakenick. I just finished reading — or heavily perusing — David Barrett’s “Dream 18,” a coffee table book with compilations of some of the world’s great golf holes. It got me to thinking about a Greenspan Dream 18, and since today I have nothing more to look forward to than watching Brendan Steele and Jason Dufner battle it out for the PGA Championship, I thought I’d give our Dream a crack. I should probably say something up front about my criteria. I do not mean to suggest that what follows are the “best” eighteen holes we’ve ever played. If it was, then virtually all of my picks would probably be located in Bandon, Oregon. Instead, I added elements like “memorability” and “place in Greenspan lore” to the list, while still putting heavy emphasis on hole quality. As well, I tried to pick holes from a variety of courses so the mythical course represented our fourteen years rather than just the last two. — Pacific Dunes, No. 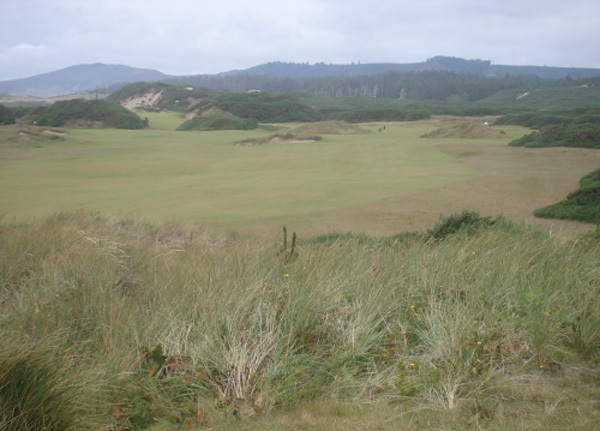 11 (Bandon, OR)(148 yards): Beach to the left, prevailing wind off the ocean, short iron in hand. Not an easy shot. Norman Cheuk teeing off on Pacific's famous eleventh hole. — Bear Mountain GC (Victoria, BC), No. 11 (135 yards): Probably as close as Canada gets to TPC Sawgrass’s famous seventeenth. Famous in Greenspan lore as the place where Greg Cheever mistook a tee marker for his ball and, in the process, created his own trophy. The eleventh green at Bear Mountain in Victoria. — Olympic View GC (Victoria BC), No. 6 (238 yards): Not a great hole as great holes go, but at 238 yards over water, a definite scorecard killer. Marshal’s complaints about our slow play there — go figure — led to our decision not to return to Victoria. Ever. — Victoria GC, No. 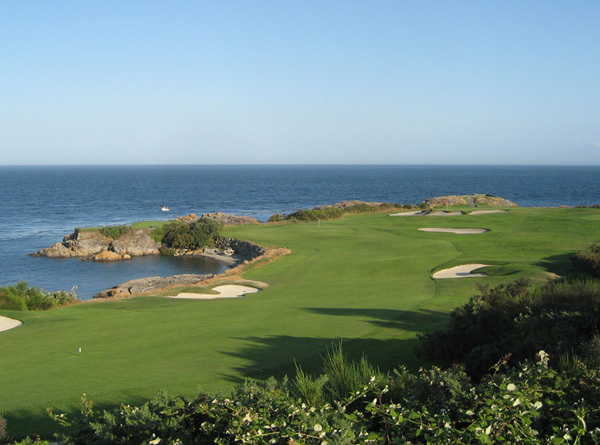 8 (Victoria, BC)(115 yards): A combination of Troon No. 8 and Pebble Beach No. 7 in Canada. May be the toughest short hole we’ve ever played. — Okanagan GC (Quail), No. 18 (Kelowna, BC)(408 yards): By general consensus the best-ever Greenspan finishing hole. The eighteenth at Quail -- a mid-iron approach over water to an elevated green with the match on the line. — Predator Ridge (Predator), No. 16 (Kelowna, BC)(455 yards): Semi-blind tee shot to a target fairway is fine, but its the second shot, a long iron to a green far, far below, that made this hole the talk of the tournament. Adam Waalkes made net 1 here in 2001 to beat me and Chris Johnson. — Pacific Dunes, No. 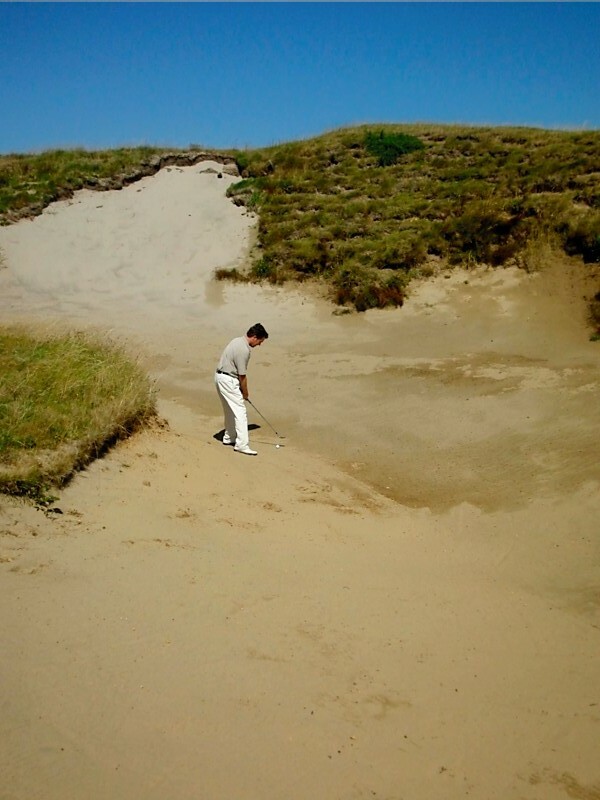 4 (Bandon, OR)(449 yards): The folks who wrote Pacific’s website claim its among the best par fours in the world. I have to agree, although I’ve never made better than 7 here. 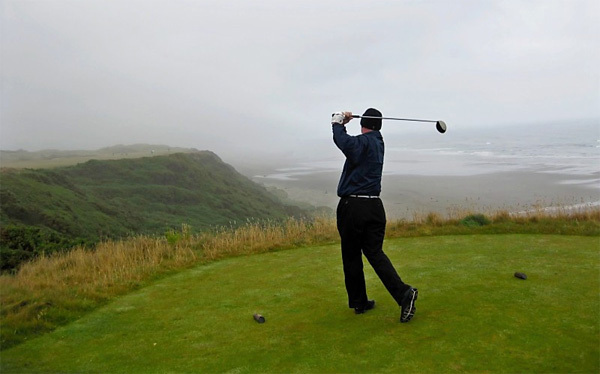 Aro hitting his tee shot off into the fog on Pacific's fourth hole, 2010. — Pacific Dunes, No. 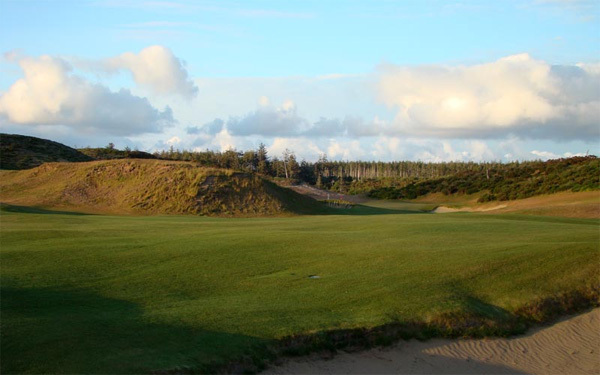 13 (Bandon, OR)(444 yards): The Pacific to the left, massive sand dunes to the right, and a prevailing wind in your face, this is no doubt one of the top fifty par fours on earth. 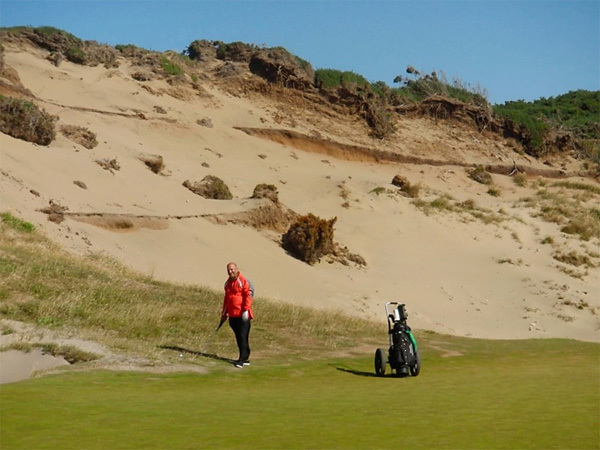 Jeff Benezra in front of the sand dunes to the right of Pacific's thirteenth green. — Bandon Dunes, No. 4 (Bandon, OR)(410 yards): Second shot is among the most beautiful anywhere. Behind Jeff Haight is Bandon's fourth green. After that is Japan. — Old MacDonald, No. 16 (Bandon, OR)(455 yards): Already banged the keyboard aplenty on this one. 'Alps' -- the sixteenth at Old MacDonald. — Bandon Dunes, No. 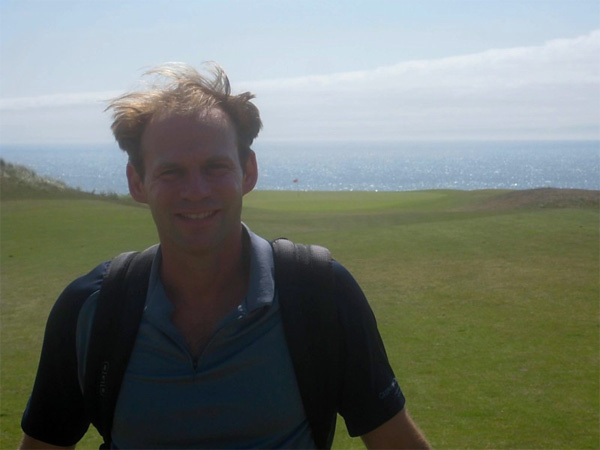 16 (Bandon, OR)(363 yards): One of the great risk-reward par fours we’ve ever played, Simon Birrell reportedly reached it with a four iron — twice. To play No. 16 at Bandon is to never forget it. — Bear Mountain, No. 17 (Victoria, BC)(311 yards): Just reachable if you really nail your drive, but miss the green and getting up and down is no easy task. Another great risk-reward hole and, as the second-to-last hole of the day, made for some serious drama. — Bear Mountain Ranch, No. 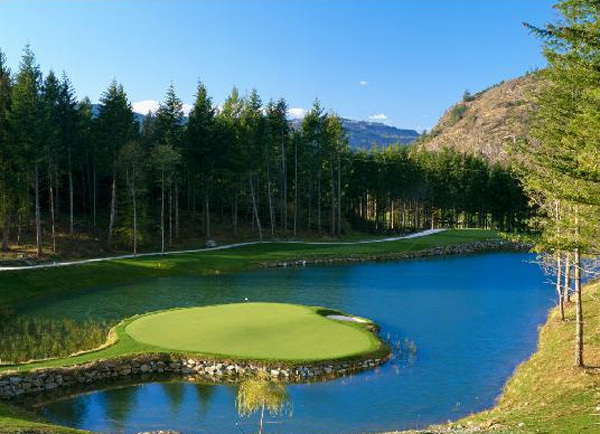 4 (Chelan, WA)(411 yards): No doubt the most controversial inclusion if anyone actually reads this entry, the tee shot here alone — blind, and over a cliff — makes this hole among the most memorable in Washington. Thinking about the tee shot on the fourth at Bear Mountain Ranch. — Victoria GC, No. 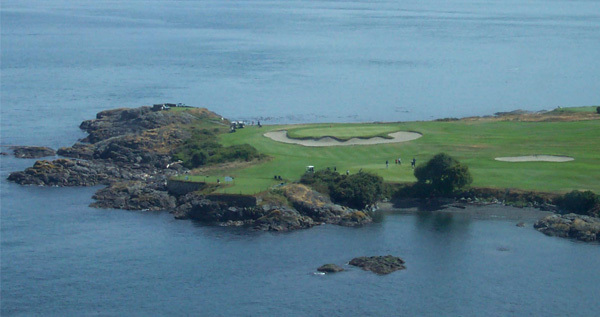 7 (Victoria, BC)(356 yards): Ocean to the left, strong winds, buried elephant under the green. What’s not to love? Ben Hogan is said to have called the green on Victoria's seventh one of the most difficult he'd ever played. — Predator Ridge (Predator) No. 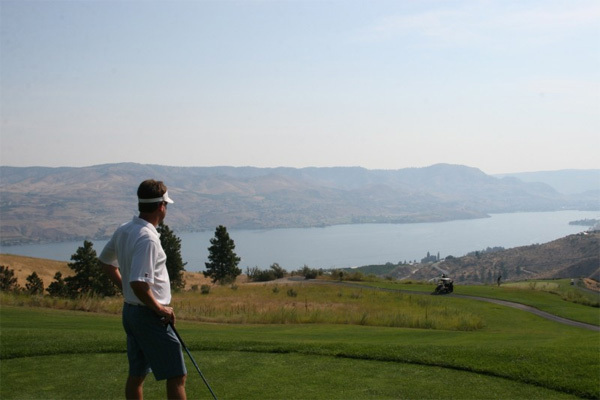 14 (Kelowna, BC)(520 yards): With a fairway that wraps around a lake on the right, this hole dares you to cut off as much fairway as possible to have a go at it in two. The green was home to the famous Scoccolo Bee, which is reason alone to include this hole on the list. No. 16 at Bandon Trails -- one very tough hole. — Pacific Dunes No. 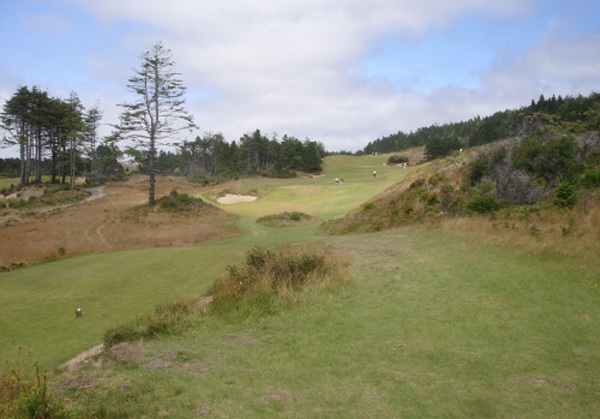 12 (Bandon, OR)(529 yards): It says 529 yards on the card, but into the wind it plays more like 629. I hit driver, 3-wood, 4-wood here in 2011 — and I was still a smidge short. If ever a hole was a hidden beast, it’s this one. In '11 I hit three full woods into the wind at Pacific's No. 12 -- and still came up short. — Harvest Golf Club No. 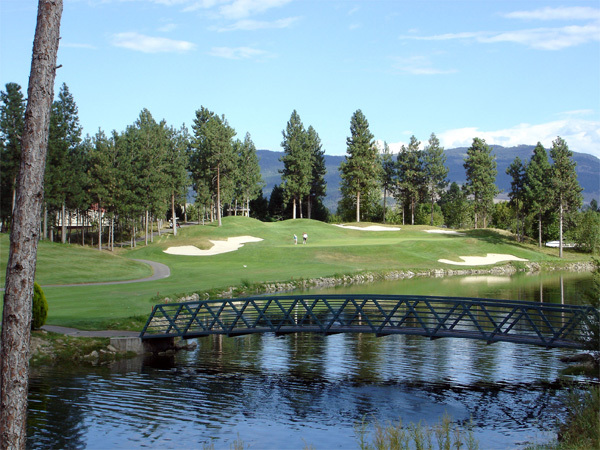 2 (Kelowna, BC)(551 yards): Very long and very open save the orchard to the left of the fairway, the second hole at Harvest captures the essence of golf there — wide, open, and fun. This dogleg left is not “great” by any stretch, but if all holes in this eighteen were like No. 12 at Pacific or No. 16 at Trails, this “dream” 18 would be a nightmare. So there you have it. Eighteen of the best golf holes we’ve ever had the pleasure to play at Greenspan. Will anyone other than me care about this eighteen? I doubt it. But it provided a nice addition to what turned out to be a pretty compelling final round of the PGA Championship (won by Keegan Bradley), so I consider its purpose served. This entry was posted in Miscellaneous on August 15, 2011 by greenlakenick. Paul Sharkey is a man of strong opinions, and he is not one to keep them to himself. Last year, the longtime World Team captain decided he had a problem with my then-new Greenspan Chris Berman nicknames — so much of a problem that he twice asked me to remove them from the site lest he be too embarrassed by them to tell anyone of the site’s existence. Rather than completely remove them I buried them on a single post — a suitable compromise by a man (me) always willing to put others’ feelings before his own. I can almost hear the conversation: BN: I don't like 'Willie' Nelson. PS: Got any better ideas? BN: No. 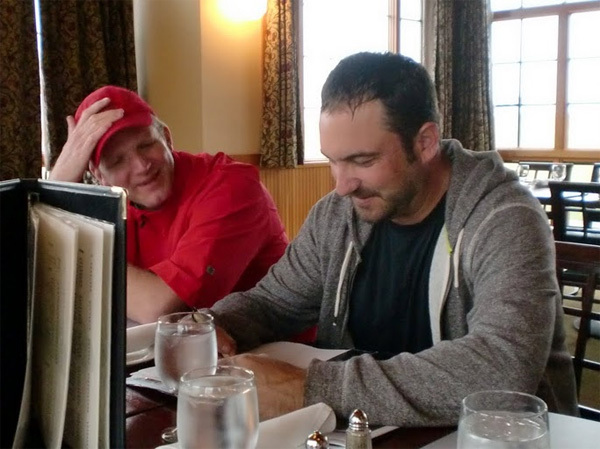 This year at Bandon, the Berman nickname critics were at it again. This time it was Brad Nelson who took the lead as Chief Popcorn Thrower. Nelson’s feelings no doubt stem at least in part from his own nickname — his Brad “Willie” Nelson is only slightly better than my own Nick”el and Dime” Jenkins. Nevertheless he was after me and after a no-win Saturday, I wasn’t much in the mood to defend my art. – Steve “If the Glove Don’t Fit You Must Ac”Whitaker — Not even the most hardened critic can deny this is greatness. – Mike “Pink Floyd’s The Wal”dner — Ditto. – Chris “Stomp Your Feet and Clap Your” Hansen — “I will, I will!” says Nelson. – Matt “English” Beaton — Even money says Beaton doesn’t know who the English Beat was. – Ed Garth “Vader” — Too easy. I kinda like Ed “Sammy Hagar”th, too. – Vince Deandre “the Giant” — This could be in the top category, but I must remain modest. – Stefan Gran “Cracker” — thought about Stefan Gran”imals,” too. – Leo Madden “About You” — What I said about Deandre. – Marty “Band” McQuaid — “Foreign” McQuaid would work here, too. – Nick “Pistol Pete” Perovich — Credit to Paul Ahern for this one. – Adam “Board” Waalkes — “Under the Board” Waalkes would work, too. – Jon “Step on the Gas”ton — Particularly fitting until he sped up his play. – Joel “Handle with C”Aro – Particularly fitting until, uh, still particularly fitting. – Jeff Haight “Crimes” — Good nickname, but Haight isn’t the guy you think of when you think hate crimes — or hate anything, for that matter. – Brad “Captain” Kirkpatrick — He later became a captain his own tournament. “Jeanne” would have worked, too. – Paul “Great White” Sharkey — So many other possibilities. “Peter, Paul and Mary” Sharkey, etc. – Rob “Rolling” Stonesifer — Obvious, but a little lacking in creativity. – Joel “Off the” Marcus — see what I said about Aro, Laidlaw. – Abe “Oh N”Otoupal — see what I said about Aro, Laidlaw, Marcus. – Jason “Haz”mat — Matzat claims no one ever called him Hazmat growing up. Yeah, right. – Andy “Mira” Kelleher — “Helen”? – Casey “Prime” Ribera — This could be in the higher category. – Pat “The Dryer At My” Scoccolo — Fitting — it it isn’t the course that’s against him, it must be the dryer. – “Tiny” Tim O’Brien — Kinda lacking in the creativity department. Tim O’Brien’s “Song” isn’t bad, but it’s not exactly happy, either. Tim “Saving Private” O’Brien is just okay. – Norman “Num” Cheuk — I had “Up” here, but not a good visual, that pic from Norman on The Clipper notwithstanding. – Chris “Elton” Johnson — Chris “You Can Call Me Ray, You Can Call Me Jay, But You Doesn’t Have to Call Me” Johnson (view) was a bit too long. – Brad “Willie” Nelson — Uninspiring, I admit. “Full,” which Gene has (more), isn’t much better. – Nick”el and Dime” Jenkins — My own nickname is lacking! – Jeff “Gentle” Benezra — “Has” would be cruel and inaccurate. – Mark “Forever” Young — So many possibilities, it’s almost impossible to be satisfied. – Brian “Cat in the” Patten — Probably should be higher but, again, so many possibilities. 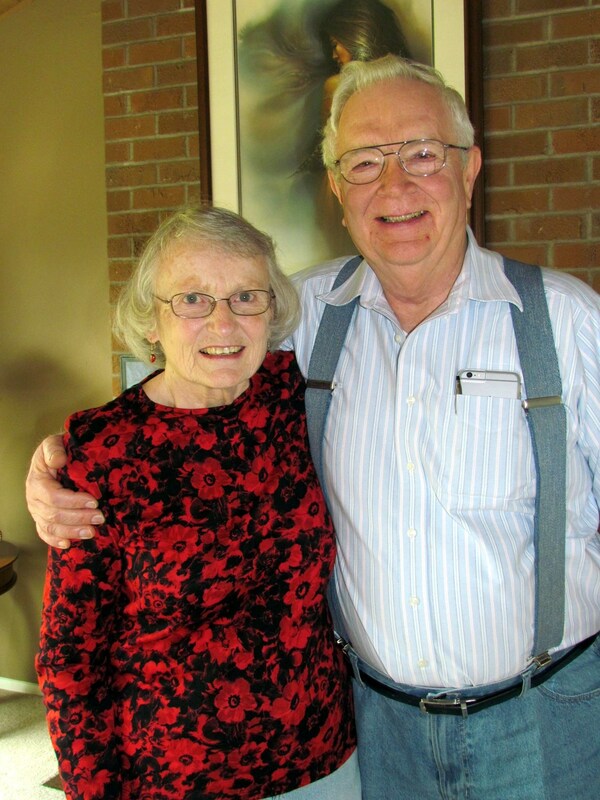 – John “Feathered” Harrison — Maybe “Sister Golden” Harrison would be better. – Paul “Town” Maier — Ho hum for a ho hum guy. – Doug Schroth”ello” — A challenge, this one. – Kent Fisher “Price” (RIP) — Better than “Bobby” or “Amy.” “That’s a big” would work, too. – Dave Sturtevant “Halen” — I challenge anyone to do any better. – Simon “Says” Birell — I like Simon Birell “Dorado” here, too. – Rob “Pulled” Thilo — Nelson was right about this one — no one pulls their thigh. – Tony “Naughty” Secretario — Had to be something about a secretary. – Bill “Paper” Ream — Reminds me of Office Depot. I’m open to suggestions for any of the names in the bottom two categories as well as one for Paul Ahern, who remains un-nicknamed. I’m particularly anxious to hear from Sharkey and Nelson on suggested upgrades. If you’re gonna identify the problem, you better also identify a solution. This entry was posted in Miscellaneous on August 12, 2011 by greenlakenick. A view from the tee. Among the most memorable holes we’ve played in fourteen years of Greenspan is the 16th hole at Old MacDonald. Known as “Alps,” it’s a long par 4 with a fairly sizable hill on the left side of the fairway, which makes the green blind to all but the longest drives down the right side. Blocked-out players aim their second shots over an aiming stick at the top of the mountain — and hope they guess their distance right. The dune on the left side of the fairway hid the flagstick to most drives and made "Alps' among the most memorable of Greenspan holes. The hole garnered a fair bit of commentary. I’ve heard it called the worst hole at the entire Bandon complex. (For my money, the 16th at Pacific wins that award hands down.) I heard Rob Stonesifer mutter that the 16th wasn’t “a real golf hole.” I remember it not because I didn’t like it, but because it began my and Joel Aro’s great unraveling in our fourball medal match against Stefan Gran and Greg Cheever. One of them — I believe Cheever — birdied it after a laser-like approach over the aforementioned aiming stick, while we could manage no better than my own three-putt double bogey after actually having a peek-a-boo look at the green with my approach shot. Two holes later, we walked off the 18th green with a half in a match we led from the start. Aro, shown here hacking it out of the fairway bunker, was among many of use whose approach shots were obscured by the mountain. Turns out that was inspired by history. To the uninformed, the aforementioned mountain is nothing more than a huge mound. As it turns out, however, there was a method to Jim Urbina’s madness. He modeled this hole after the 17th at Prestwick (also known as “Alps”), site of the first British Open, twenty-four others, and a likely destination for many of us during our 2012 Scotland trips. 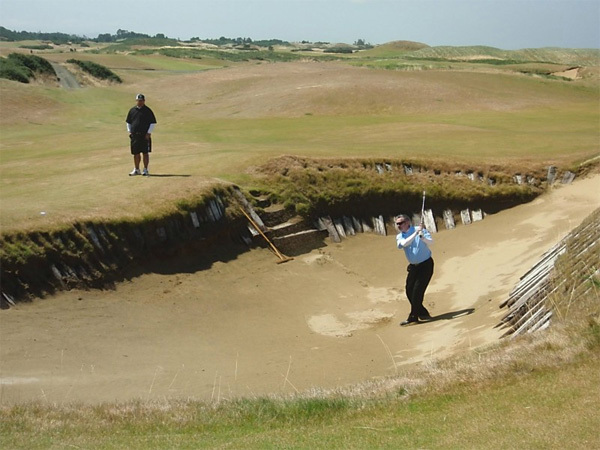 One blogger even did a full entry comparing the Old Mac and Prestwick Alps holes. There are also versions of Alps at Fisher’s Island and National Golf Links (more), both rated among the top 100 courses in the world. Call it cool, call it awful. Just don’t call the 16th at Old Mac an accident. I, for one, am looking forward to playing its Prestwick inspiration. Here’s hoping I can manage better than a six. This entry was posted in Miscellaneous on August 6, 2011 by greenlakenick. Today we kicked off Greenspan Cup XIV with a practice round at Pacific Dunes. It did not go well. In fact, it went very badly. 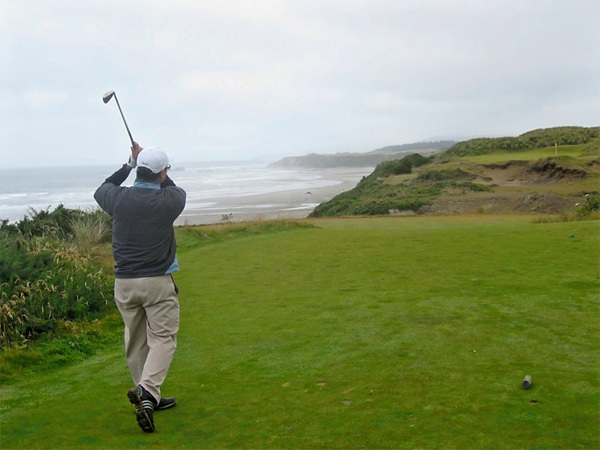 The wind made Pacific Dunes too much for most of us, including me, shown here on my way to a fourth straight triple. The team of Adam Waalkes and Steve Whitaker won the big money with a bestball net score of 69. Remarkably the second-place team could manage no better than a 75. That’s best ball. Net. It wasn’t the Bataan death march, but for a bunch of well-egoed golfers, it was something quite close. This entry was posted in Miscellaneous on July 28, 2011 by greenlakenick.